Hasan Atik, an LGBTI+ rights advocate running for a seat in the Turkish Parliament as the 4th candidate on the ballot list from the People’s Democratic Party answered Kaos GL’s questions. AKP’s 2015 General Elections Brochure. “AK Party has been in power for 13 years. Within the very first 4 years of its existence, it was able to solve the problems of the conservative segment, which brought [the party] to power, despite having to fight against threats of party closure. “Turkey is a country that can hold a Gay Pride on Istiklal Avenue even in the middle of the month of Ramadan. The increased visibility of conservative people does not carry the meaning that there is an intervention against people’s life styles. “Yes, now there is visibility of more people in head scarves and people who can practice their religion more comfortably because they were under pressure before. It is indeed true that LGBTI Pride Parades took place without incident for 12 years. The number of participants increased each year and the 2014 Pride Parade was attended by an estimated 90.000 people. 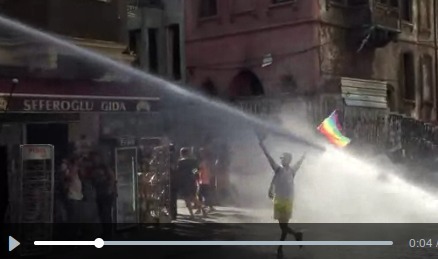 However, the 13th LGBTI Pride Parade on 28 June 2015 was blocked by the governor and police used tear gas, water cannons, and plastic bullets to disperse the participants. The violence on Pride Parade came after weeks of homophobic statements by leading Justice and Development Party representatives and pro-government, conservative media.